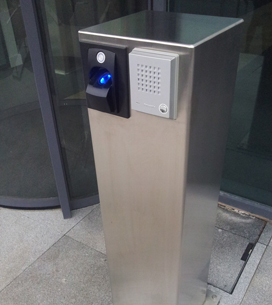 Videx has launched a new biometry access control reader for building use such as in offices and schools. Entry into and out of an area relies on a person’s unique characteristics, in this instance their finger print, rather a fob carried, or a PIN number remembered. The flush finger print readers complement the range of finger print readers already available from Videx but will fit a standard UK flush single gang electrical box. This range is for internal use only and available in a selection of six finishes to suit any decor. Steve Natton, Special Projects Manager at Videx said: “When it comes to access control, a fingerprint is the most secure means of authentication because PIN numbers can be discovered and fobs or tokens can be lost, copied or shared among people. Using capacitive technology, the reader reads the ridges and valleys that make up a finger print. The pattern of these ridges and valleys is then compared with stored data using an algorithm which compares the data and decides depending on the security level if the finger print is a match to the data stored. The finger print as a whole is not stored in the reader, just the data needed to verify a match. If a match is found this is then referred to the access controller to either grant or deny access based on other requirements such as access level or time bands. 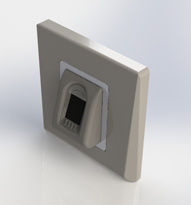 The new reader is designed for the UK single gang electrical box and enables first fixing without the worry of knowing unique dimensions or fitting requirements for the product. It also enables flush electrical boxes to be used for different types of installation such as for solid walls or plasterboard walls. The fingerprint reader has an industry standard Wiegand output enabling the reader to be used with Videx standalone and networked access control systems as well as third party access control systems supporting the Wiegand protocol. 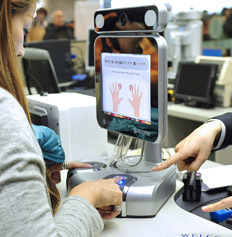 For more on the new biometric range visit: http://bit.ly/1FzK8tD.